When we moved to our new place, one of the first things I bought for Chuck's new "big boy" room was a large world map. I intended to teach him about all the different places and people in the world. Well.... lots of other things came up and that dream never quite panned out. That's why I was excited for this week's preschool collaborator challenge. It's all about map learning! Yup. This challenge gave me a swift kick to the bum to think of an easy and fun way to help preschoolers learn about maps. I came up with this idea to travel the globe with the Planes and Cars characters! Let's Learn Geography with Disney's Planes and Cars characters! 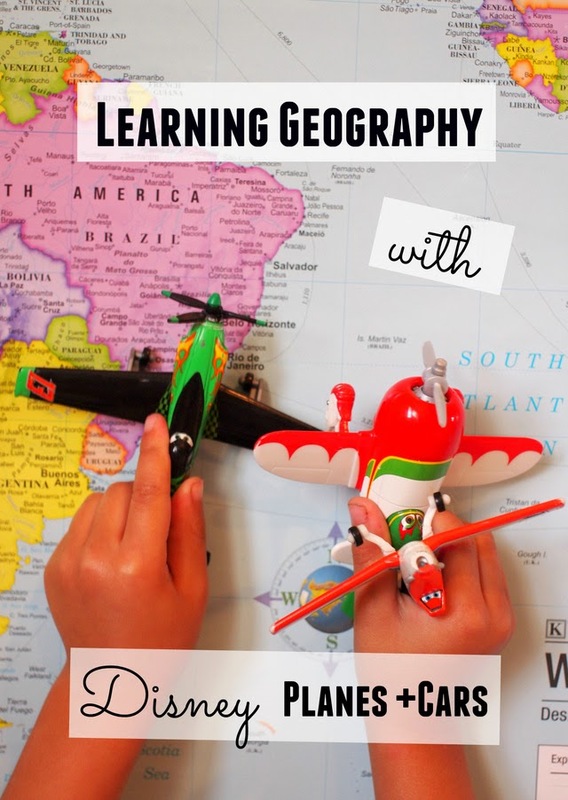 So keep reading to see how I (and 4 other bloggers) taught our preschoolers all about maps! Ever since I saw Paging Fun Mom's pizza box airport, I knew I had to make one for Chuck. I mean, my goodness, what a neat way to use Christmas lights! So here's my version of a Cardboard Airport Runway. We're just "plane" crazy for planes and transportation crafts over here. 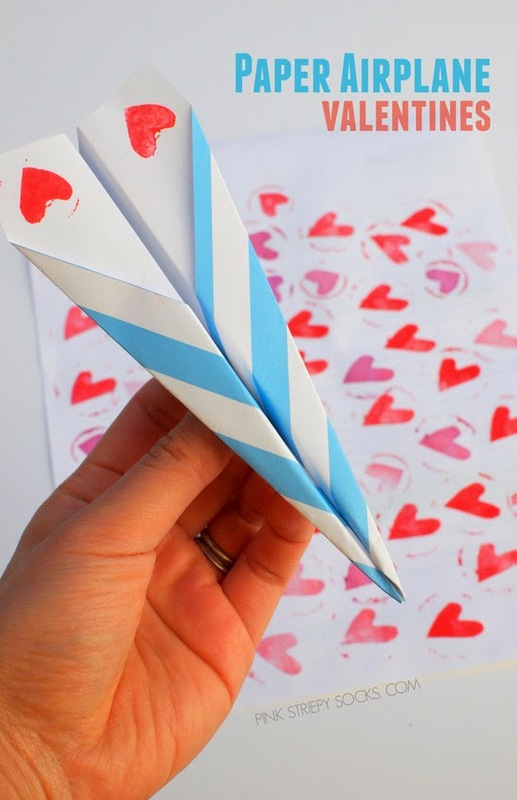 And if you're looking for a Valentine that soars above the rest, then you'll love these awesome paper airplane Valentines. They don't take very long to make and would be perfect to hand out to classmates! The plane obsession continues over here! Just when you think we're done with transportation crafts... oh no... we've got another one up our sleeve. Awhile back Chuck and I made this toilet roll biplane. But sadly, that plane broke. Chuck still loves biplanes, so I came up with this super easy practically unbreakable cardboard biplane craft for him to make and then fly. 18 Transportation Crafts that "Go!" Do you have a plane, train, helicopter, truck, boat, car, or spaceship loving kid? While looking through the archives, I realized that we've done quite a few transportation-related crafts here. 18 to be specific! (Whoa. Kinda cray-cray and kinda cool...) So I thought it would be fun to take a walk down memory lane and share this compilation of all 18 crafts that "go" here! 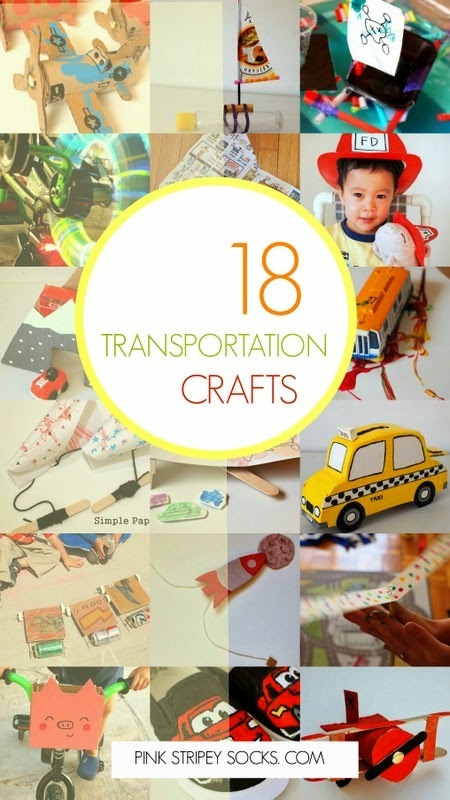 18 Awesome Transportation Related Crafts! Ok. I gotta admit something to you. I was originally going to call this post, "Crafts for Boys" (that's why it's in the permalink) but then totally decided against that name. Girls can like cars, trains, planes, boats, trucks, and bikes too! Right? Right. Ack! Sometimes it's so easy to fall into gender stereotyping. (Do you ever feel the same way?) So anyway, that's why I changed the name to Transportation crafts. Although Chuck isn't always so keen to craft with me (sad, I know,) he fortunately loves making cardboard toys with me. (Yay!) Currently he loves planes. But since we've already crafted toilet roll planes, toilet roll helicopters, and cardboard roll space shuttles... I was at a loss as to what we could make together next. One day he suggested that we make a biplane together. 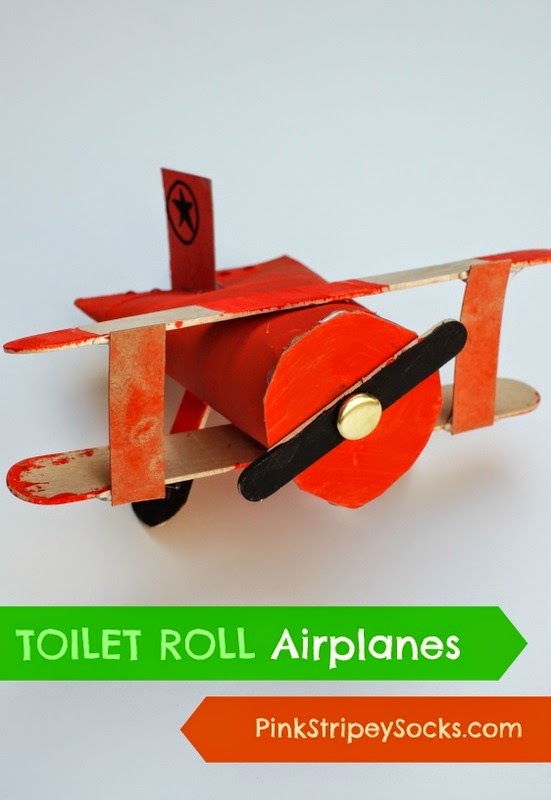 So we went with his suggestion and did this toilet roll biplane craft! Note: This post contains affiliate links. Thank you so much for your support! I think he looks a little like Leadbottom from the movie Planes, don't you? 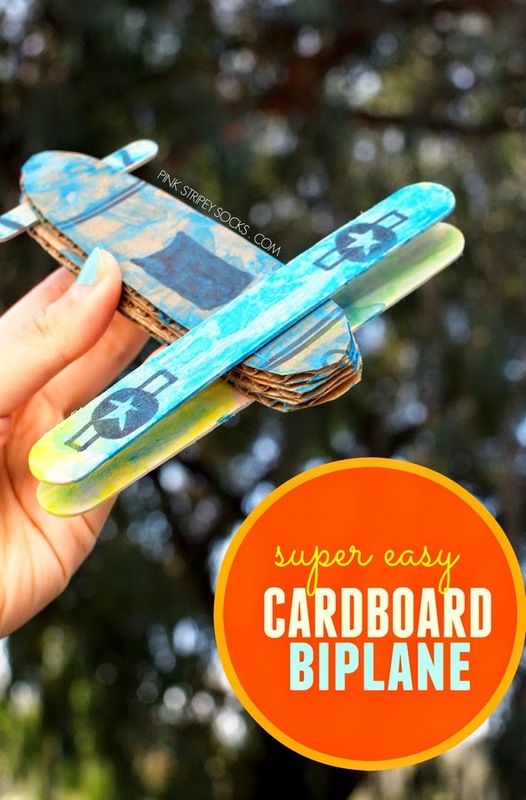 Check out how we made this simple plane from recycled materials below! Our epic move still looms overhead. The movers are coming next week and then we fly off to California a week after that. I keep trying to explain what's happening to Chuck, but I'm not sure he gets it yet. So I came up with this easy craft and activity to help him out. It's a DIY Magnetic Transportation Map Activity where you move different types of transportation across county using magnets! Chuck really enjoyed helping me to color in the map and different types of transportation using watercolors. He also REALLY enjoyed moving everything around using magnets. It was a bit of trial and error to put this toy together, but at the end we came up with a craft that's easy to make, fun to use, and *hopefully* helpful for Chuck. Initially, I titled this post "Bad Mamas make toilet roll airplanes" because I wanted to admit something to you. Yup, you read that right. I'm a bad mama... a really bad mama... why? Well, the other day we were playing around with Chuck and we started humming different songs for him to guess. At first we hummed his favorite song ("Life is a Highway" from the movie Cars) and he guessed it! Intrigued, we kept humming other songs from Cars 1, Cars 2, and Planes (his faves.) He couldn't name the songs specifically, but he could identify the movie that each song came from. And then I started humming "ABC" to him, thinking that it would be a breeze for him to guess. I got through the entire song and then my son... my dear, sweet, transportation-loving child, looked up at me and said "Me no know mama." What?! "Me no know?" He knows songs from movie soundtracks... but can't recognize ABC? We sing ABC to him at least twice a day when we brush his teeth. Oof. Double oof. So... this reeeeeeaaaaally long intro was just my way of saying that my son loves cars, planes, trucks, trains... erm... basically anything that moves. So I thought I'd try to foster his love with a toilet paper airplane craft. 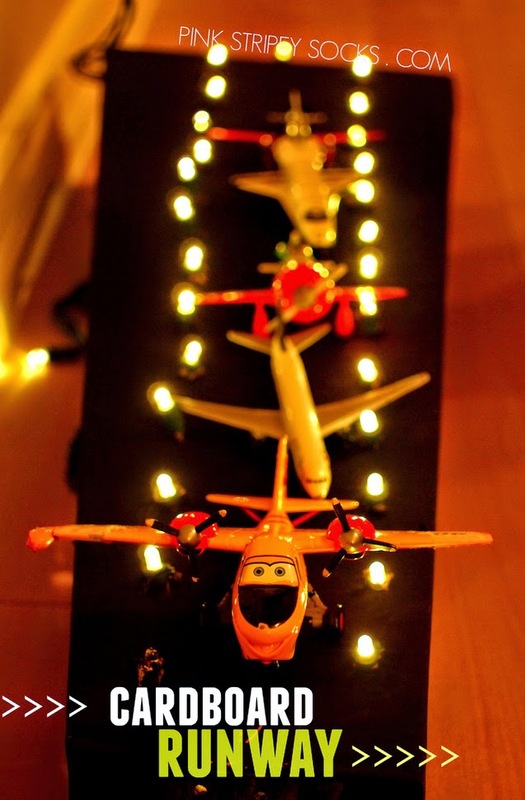 These planes were inspired by the characters Dusty Crophopper and Skipper from the movie "Planes."